Liv Kristine…Liv Kristine Espenæs…Liv Kristine Espenæs Krull. I have listened to her singing on Theatre Of Tragedy albums, on her solo album back in 1998 (Deus Ex Machina), or on Leaves’ Eyes albums lately; whether it was doomdeath, gothic, atmospheric, electro/electronic-pop or just pure metal, she has proved as one of the most gifted voices in the metal world, displaying such an uncanny versatility and such skills that she became one of the best female vocalists in the area. After parting ways with her former band in 2003, with the help of her husband (Alex Krull, frontman of German band Atrocity) she has founded a new band – Leaves’ Eyes which is practically herself plus the German quintet. The release of the debut album last year (Lovelorn) was well received, displaying a trendy melodic gothic metal that allowed Mrs. Krull to show her great vocal skills; my only concern was whether this new band was just a project and how much future did it have at that point. Apparently just to put my mind at ease, a new album was released this year, this sophomore effort being a natural progression of the established new band sound. The sound of the album reminds me more of the aforementioned gothic Deus Ex Machina with a powerful injection of strong Atrocity musicianship rather than the electro popish sound of Theatre Of Tragedy last releases. Compared to the Lovelorn album, Vinland Saga is a much more ambitious project, a concept album about the Norwegian seaman Leif Erikson’s journey (a millennia back) towards the New World (allegedly the first European that got here). Deeply rooted in the Norse legends, the album paints some incredible scapes, alternating the stormy voyage with beautiful love story and quiet odes to nature and its elements. Liv Kristine’s lyrics transport you into the story, making you actually see the beautiful Norwegian coastline scenery or feel the gale on the dangerous waters. Her warm and elegant voice rises and decreases with each wave that the ship is passing, unearthly beauty vocal lines and harmonies carrying you along the Norsemen saga. The atmospheric tracks like the opener Vinland Saga, with serene vocals and ancient times sound induced by timpani based rhythm, or the acoustic love ballad Leaves’ Eyes, with Liv Kristine delivering one of her best performance on the album, backed by great keyboard lines beautifully crafted arrangement, blend in harmony with the heavier tunes like the Atrocity representative The Thorn, (with Alex Krull deep mean vocals backed by a dark moody rhythm shape shifting the melodic backbone of the song) or the heavy and catchy Twilight Sun with a keyboard driven rhythm and its addictive chorus. The main force of the band though lies in the ability to blend Liv’s powerful and emotional voice with the power sound of the band, from here resulting a superb gothic sound, full and rich, dark and introspective, with angelic, almost child-pure vocals, allowing her to display her excellent range and her unique ability to turn each song into a journey of self-discovery. The anthemic Farewell Proud Men has a rich sound of keyboards and guitars with good drumming, soaring vocal lines over operatic backdrop vocal lines. The first single of the album, Elegy has more of a mainstream feel, (in the vein of After Forever and Epica) with excellent vocal harmonies and heavy melodic guitar drives. High notes sung flawless, backed by an atmospheric wall of keyboard sound. The chorus duet between Liv and the wailing guitar hook is absolutely superb making the song a true masterpiece of gothic genre. The alternation between quiet and serene parts, with soprano leads over piano/keyboards background and full forced guitar driven sounds is masterfully crafted in Solemn Sea (with a Krull/Krull duet) and on the New Found Land track, with powerful backing chorus, a vivid scenery of deep dark waters, with pounding drum rhythm enhancing the atmosphere. Misseri (Turn Green Meadows Into Grey), an epic track with good piano leads and full round sound shows again Liv’s abilities to lead the song into the most surprising places. The Celtic influenced Amhran (Song Of The Winds) is a quiet piece with soprano leads doubled with vocal harmonies, kettledrums and background score keyboards. Mourning Tree is a medieval introspective piece sung heartfully with acoustic guitars and string arrangements and the closer, Ankomst is a fluid ending to the saga, with pure vocals and a solitary piano leading the strings into a staccato drum closing. 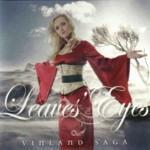 After the second release, Leaves’ Eyes has become a force in the gothic area, ready to claim its place at the top of the genre. Strong musicianship between the members of the band, real talent and inspiration makes the band a force to be reckoned with. A definite must for all goth metal fans out there.